Colorado caterer Goldy Schulz cooks up big trouble as she tries to help her longtime friend and fellow chef Yolanda Garcia. When the rental house shared by Yolanda and her irrepressible aunt Ferdinanda is destroyed by arson, the pair move in with cop-turned-PI Ernest McLeod. But then Ernest is shot dead and his house is set on fire, nearly killing Goldy, Yolanda, Ferdinanda, and nine beagle puppies that Ernest had recently rescued from a puppy mill. Concerned for her friends, Goldy invites them to stay with her while the sheriffs department investigates. Yet even Goldys house isnt safe, and after a failed break-in by an unknown intruder a cop is sent to keep an eye on things. Then a second body is found. Swapping her chefs hat for a sleuthing cap, the intrepid Goldy steps up the investigation. But shes got to move fast. Its crunch time to close in on a killer, before he can close in on her. 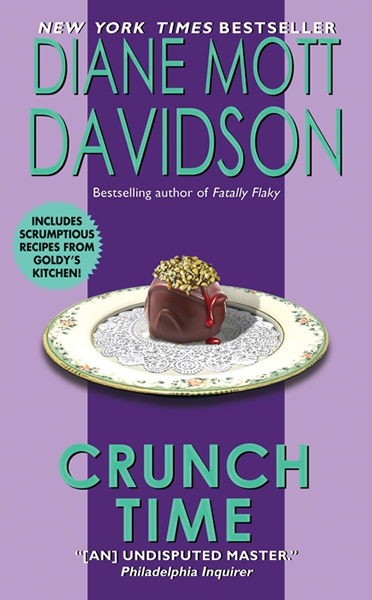 Filled with danger as well as laughs, wonderful food, and scrumptious recipes, Crunch Time is a delicious indulgence sure to satisfy all of Goldys fans.